Well, to be truthful, most aren't full-on nekkid. Most have some degree of artsy body paint covering up their vitals, as well as the body's largest organ. To me, riding in the parade looks like great fun. It's something I've wanted to do for a few years now. But I've never quite worked up the courage to get full-on naked, have someone paint me (oh, that would tickle), and then ride in a parade where spectators hoot, point, and giggle. I think the biggest hurdle has been the thought of my co-workers having photos of me on their cameras. Yeah, that's just something I don't exactly want floating around the office. But, since I no longer have co-workers, I'd be game. The problem is that the parade is being held today. In Seattle. And I am in Michigan. Poo bah! I guess I'll have to wait until next year's solstice. While we're on the topic of naked bicyclists, perhaps now is a good time to say that bicycling does wonders for the naked body. I probably don't weigh any less now compared with when I started the trip (as muscle weighs more than fat), but I've definitely trimmed up. I think it's safe to say that my winter hibernation layer has disappeared. Though the fat has disappeared, tan lines have now made their appearance, despite the daily application of some heavy-duty suntan lotion. The most noticeable tan lines are on my legs, where my bike shorts end. Surprisingly, I don't have any tan lines at my sock lines. (I'm wearing socks with my Tevas everyday so as to minimize the Teva lines.) As I'm wearing long sleeves, gloves, and a neck scarf, I fortunately don't have too much sun exposure to my upper body. I ramble. Truth of the matter is, though, that there's no better time to be a naked cyclist in the Fremont Solstice Parade than when your body has been tranformed by a long cycling adventure. Ok, time to switch topics to the events of the day. We awoke at 5am, packed up our things, and left the Four Seasons Motel. The forecast indicated threats of nasty weather throughout the day, and we wanted to make as good of progress as possible. Ready to set out for the morning. The boys decided to ride like speed demons. So, they went ahead, and I was on my own today. Which I rather quite enjoyed. It's now been more than a week since I've ridden solo, and I've missed the opportunity to "live inside my head," which is one of my favorite things about bike touring. I've noticed that when I bike on my own, I take more frequent breaks, I look around more, I do a lot more thinking, and when I do ride, I ride faster than when I ride with other people. I also stop to talk with other tourists. Andrew, who is a seasoned tourist, is riding across the Northern Tier this summer, riding 4,500 miles from Bar Harbor, ME to Seattle, WA. 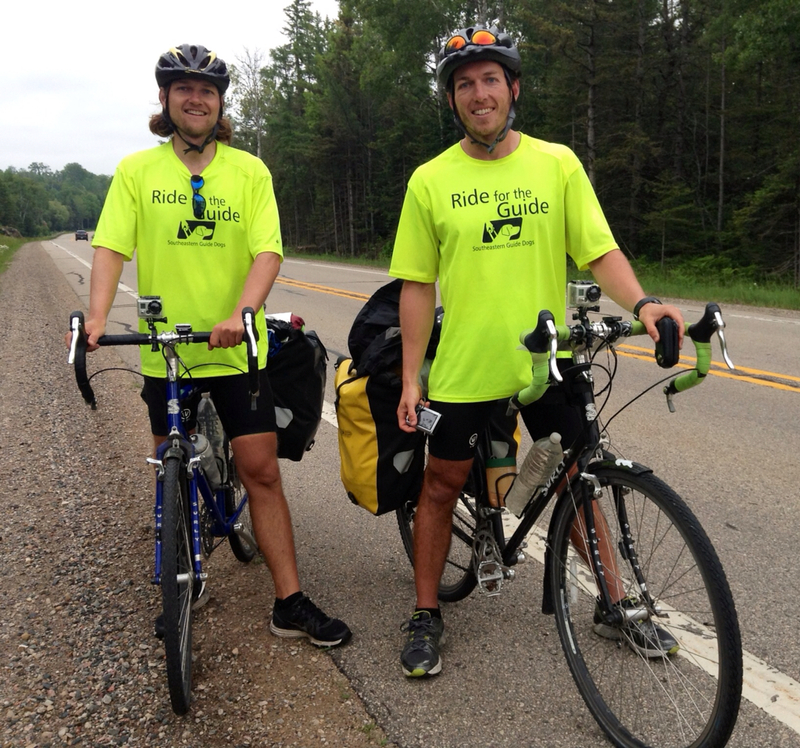 While on his ride, he is raising money for a non-profit organization called "Ride for the Guide." Check out his website and blog here: www.RideForTheGuide.com. His friend, Matt, is joining him until Minneapolis, at which point Matt needs to duck out to head back to work. Awesome guys biking for an awesome cause. I'm all over that. 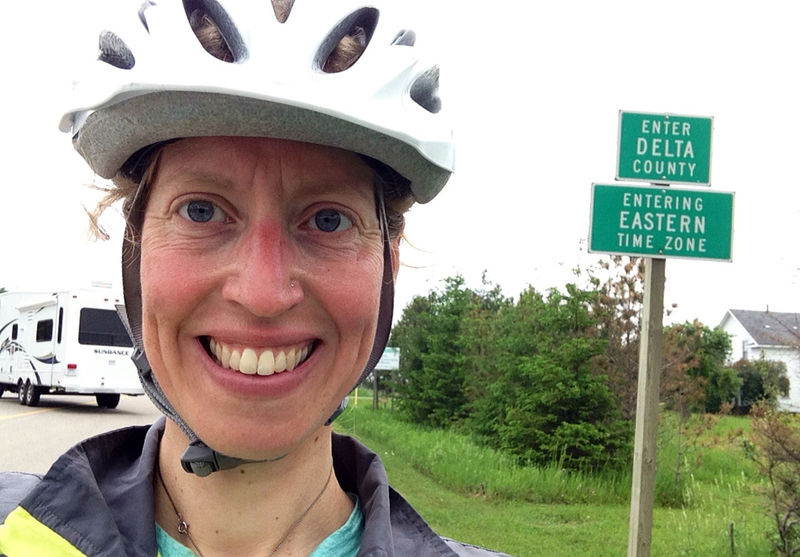 Later down the road I pulled into Escanaba, not having encountered a single drop of precipitation the entire day! I met up with the guys, and then we biked the final few blocks to the shores of Lake Michigan. Ah, good ole' Lake Michigan! We splurged on 314.2 square inches of pizza (with yours truly consuming 113.1 of the square inches) and then settled in for the night at the Upper Peninsula State Fair Grounds. We were lulled to sleep by the sounds of cars racing on the racetrack just a few hundred feet away. Ok, maybe I was the only one who was lulled to sleep. But, rest assured, thoughts of naked bicyclists were dancing in my head as I drifted into oblivion.